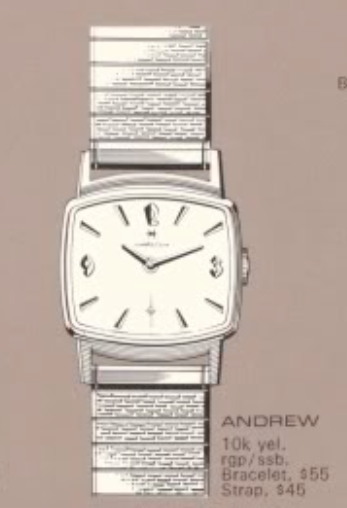 By the end of the 1960's Hamilton had acquired the Buren watch company. When production ended in Lancaster PA in 1969, Hamilton moved production to the old Buren facility in Switzerland. Buren's presence in the lineup occurred long before that though - as most of the "thin" models use Buren manual wind movements or micro-rotor automatics. 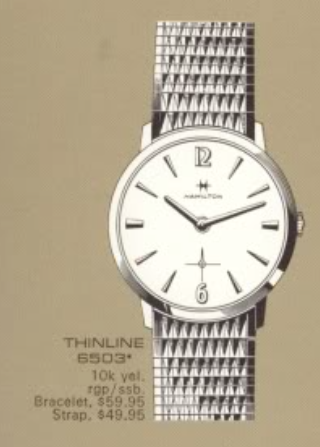 The 1968 Thinline 6503 uses a manual winding movement, the Hamilton 639. The Thinline series lives up to its name and as you would expect, they are very sleek watches. I like them because the are really easy to put back together because the arbors on the wheels are so short. The wheels just line themselves up, most of the time. The 6503 follows the usual naming nomenclature. The first digit 6 means it's in a 10K RGP case. The second digit 5 means the back is stainless steel. The 03 doesn't really mean anything other than perhaps it's the third model in the 65XX series. Although the watch came on a specially selected bracelet or a strap, my project watch has a different bracelet. It's K-Flex bracelet, which I'm not familiar with. The watch and bracelet are in great shape overall but like all new-to-me watches, it gets a trip to the spa before it sees any wrist time. The stainless steel back is deceiving. You instincts might lead you to try to open it from the back but this is a front-loader and opens through the crystal. The markers on the radial-finished dial are thick and bold. The numerals are especially deep. This dial looks new and near perfect to my eye. The 639 is used in many of the Thinline models. It's a well-made movement and fully jeweled. Everything is cleaned and dried before being reassembled with fresh oil. This movement actually gets four different lubricants in various places. The running movement goes onto the timer to "see" how it's running. The timer actually listens to the ticking though so in reality the watch goes onto the timer to hear how well it's running. It's running pretty much right where I like to leave them after reassembly. I find movements tend to slow down slightly after a little while. It all goes back fairly easily although I had to replace the female side of the two-piece stem so the crown would stay put. I think the bracelet looks pretty good so I reinstalled it. I think Thinline 6503 is sharp looking watch.